I have already written about this year’s Tournament a couple of times, the most recent introduces this year’s competitors. Tonight I attended an opening evening at Royal Armouries by invitation. It was an honour to be asked along. There was a talk on the history of Tournament and a chance to get a closer than usual look at some of the exhibits. There has been Jousting in Leeds at the Royal Armouries since 1996. I didn’t start going regularly till the turn of the century but my children loved going to see the Jousting and Falconry and I went from time to time with friends too. Now the Jousting is a central part of the year for myself, my son and his fiance. We go to pretty much any Jousting that the Armouries put on. We also attend any horse stunt shows that Atkinson Action Horses put on at the Armouries. 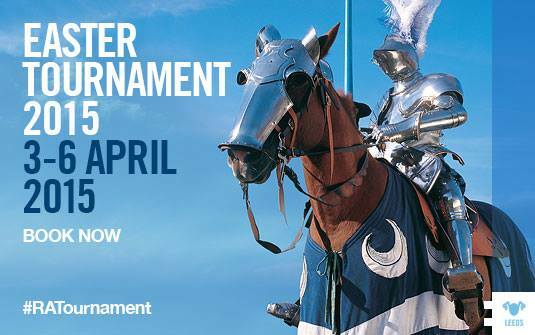 The Royal Armouries are very keen to keep improving the Tournament. This year they have invited more Knights than in recent years, there are both individual and team events and a mounted melee for the first time. The mounted melee involves all six knights being involved at once armed with wooden clubs. 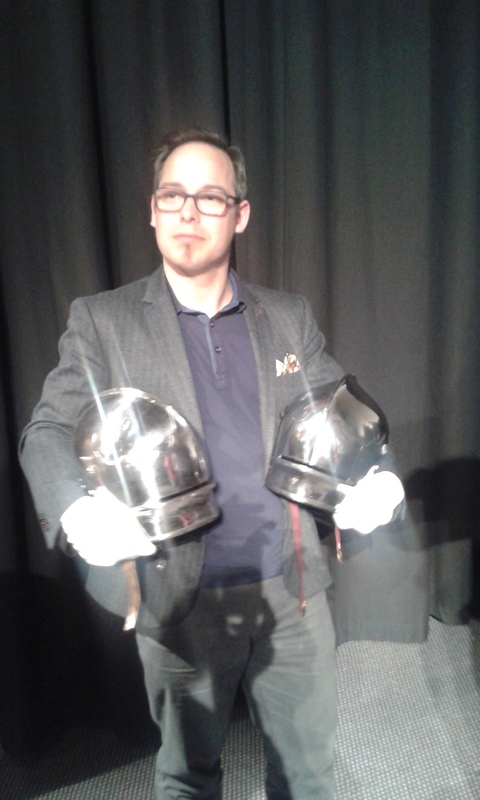 Ben van Koert, a member of the Burgundy team, showed me the helm he will be using in the melee. He pointed out a small dent and told me that iot was sustained from a full force blow from a pollax. The dent really was quite small, an impressive helm indeed. Ben and his helm came face to face with the original upon which it isd based. The similarities were very obvious and more impressive given that the armourer that made it for Ben had only photos to work from. The original is in Ben’s right hand. This helm belonged to the von Trapp family, yes THE von Trapp family, well at least their predecessors as the title changed family. The families agreed to keep the collection of arms and armour intact and indeed did so. I spoke to Ben’s team mat, Steve Gagnon, about the horses he uses in his native Quebec. I must admit to forgetting the name of the breed but they are a draft stock, usually quite stocky but Steve trains and rides a taller more agile branch of the breed. He also uses American Quarter Horses, a friend of mine used to work with this breed in land management. Stacy van Dolah-Evans is the Marshall for this event and he told me that a few aspects of the Tournament are still under discussion between him and the competitors. This mostly revolves around the melee, to concentrate on how to make it the best spectacle for the audience, and yet safe for all involved. It must be remembered that this is a full contact sport on horseback, everyone is fighting to win. So even though I have seen many Tournaments at the Armouries there may be rule changes that I can’t predict. I will right about the event in review and detail exactly what rules were used. I hope to bring more insight from the competitors if possible, we’ll see how that goes. Also among conversation at the event another blog was discussed. The Jousting Life is a marvelous blog that looks at Jousting news from around the world. I often pop on the blog to read articles old and new. I thoroughly commend it to you. This entry was posted in Events, News and tagged Atkinson Action Horses, Jousting, Knights, Royal Armouries.